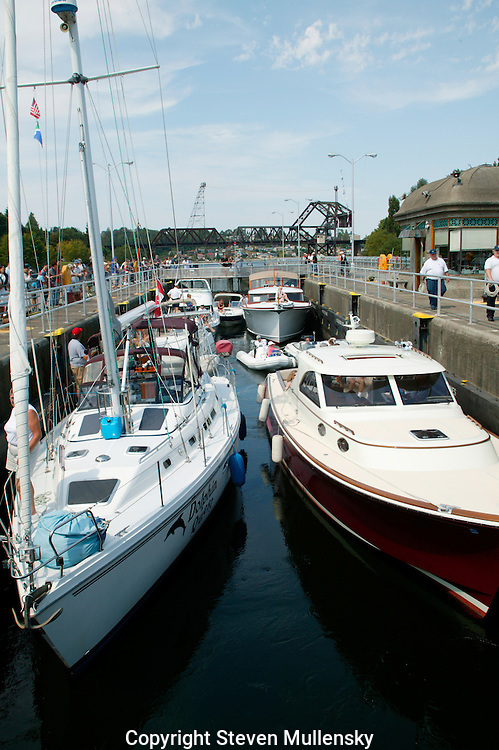 The Hiram M. Chittenden Locks are a complex of locks that sit in the middle of Salmon Bay, part of Seattle's Lake Washington Ship Canal. They are known locally as the Ballard Locks after the neighborhood to their north. (Magnolia lies to the south. )..The locks and associated facilities serve three purposes:.. * To maintain the water level of the fresh water Lake Washington and Lake Union at 20?22 feet above sea level (Puget Sound's mean low tide).. * To prevent the mixing of sea water from Puget Sound with the fresh water of the lakes (saltwater intrusion).. * To move boats from the water level of the lakes to the water level of Puget Sound, and vice versa...The complex includes two locks, a small (30 x 150 foot, 8.5 x 45.7 meter) and a large (80 x 825 foot, 24.4 x 251.5 meter). The complex also includes a (235 foot, 71.6 meter) spillway with six (32 x 12 foot, 9.8 x 3.7 meter) gates to assist in water-level control. A fish ladder is integrated into the locks for migration of anadromous fish, notably salmon...The grounds feature a visitors center, as well as the Carl S. English, Jr., Botanical Gardens...Operated by the U.S. Army Corps of Engineers, the locks were formally opened on July 4, 1917, although the first ship passed on August 3, 1916.They were named after U.S. Army Major Hiram Martin Chittenden, the Seattle District Engineer for the Corps of Engineers from April 1906 to September 1908. They were added to the National Register of Historic Places in 1978.